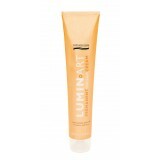 LUMINART professional permanent colouring system is formulated using a unique illuminating cream with protective and conditioning ingredients to create vibrant long lasting colour while also maintaining and building healthy strong hair. Formulated using unique Micro Pigment Technology, Luminart Permanent Colour Cream allows for maximum colour pigment absorption by the hair without altering its structure. Micro pigments sink deeper into the hair’s cortex resulting in perfect coverage and intensity. Kakadu Plum Extract: an excellent antioxidant to help protect against cell damage from free radicals and one of the world’s richest sources of vitamin C.
Bamboo Leaf Extract: also rich in antioxidants, it strengthens and improves the condition of the hair structure. Coconut Oil: readily absorbed by the hair and retained to protect essential amino acids that make up the hair. UV Filter active EHM (ethyl hexyl methoxycinnamate): absorbs UV rays for longer lasting protection and shine.